For the middle weekend of Scottish Food and Drink Fortnight, MJ and I, along with friends Hannah, Alison, and Tracey (not to mention Scottish Food and Drink Fortnight’s very own Hannah Ewan) popped along to multi-purpose arts venue, Summerhall, for an evening of…well, I really wasn’t too sure what to expect, aside from it involved cooking in some way, as the audience was invited to bring along one raw ingredient each, to contribute to a shared meal. The show, Only Wolves and Lions, has been touring around various towns and cities across the UK and Europe. Created and performed by Leo Kay and Unai Lopez de Armentia, you are invited to an involving and participative evening, exploring the role that food plays in bringing us together and relieving our collective isolation, how it shapes our social lives and society, and how we derive happiness from the shared experience of eating. Once we’d got over the initial joy of tapping in to our inner bonobo [EF – making monkey noises], (one of those “you had to be there things”) we paired off to come up with suggestions for what we’d do with the bounty that we’d brought, along with the store cupboard ingredients that had been provided. What we came up with was recipe suggestions for a chocolatey beef stir-fry, meat and veggie Moroccan stews (MJ’s project), fennel and courgette tempura, avocado salad, stuffed peppers, a carrot and rice dish, and several other bits and pieces. Chipolata sausages and apples were two ingredients that were left over from the recipe brainstorming, so I undertook to turn them in to a quick and simple curry. We then got to work, with the next hour focussed on working collaboratively to turn the ingredients in to a meal. My task was pretty straightforward, so it was just a case of letting the sausages, apples and onions cook down for as long as possible, in a base of aromatic spices. There was much busying around, as shared ingredients were passed between the half dozen different cooking stations, where we all worked with single gas hobs. The feast that came together was quite spectacular, providing us with a range of different things to try. Highlights, for me, were the Moroccan stews and the fennel tempura, but everyone had done brilliantly, with no disasters and everything tasting really quite accomplished. We then reflected on the experience of what we’d done, and considered some of our own personal experiences of collective dining, particularly talking about family gatherings, like at Christmas. We shared three minutes of silence, to consider things, then matters drew to a conclusion with a riotous sing-song, with much rice, salt and flour cast to the winds, in a symbolic purging. After a little tidying, we boxed up the leftovers and were on our way. Aside from a really good feed, we’d shared an interesting exploration of the bond and focus that food plays in our lives, as well as renewing the innate enjoyment that we derive from large group dining. Many thanks go to Leo and Unai for a really enjoyable performance. 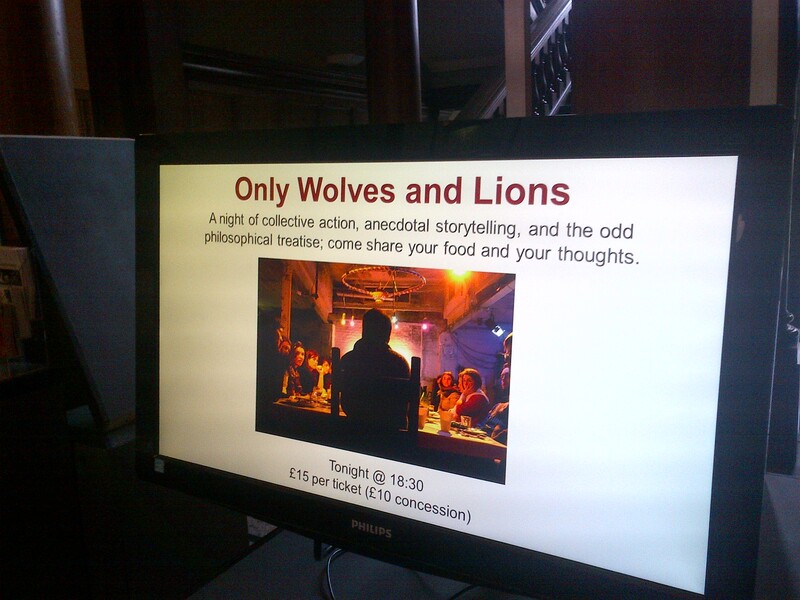 If Only Wolves and Lions comes to a city near you (or back to Edinburgh), we’d recommend it, as it was a really entertaining and thought-provoking evening. Read more on the Only Wolves and Lions blog. Last updated by BKR at September 10, 2014 . Sounds like it was a great event, and what a smashing guest blog. Summerhall certainly seems to play host to some inventive food-focused events – really enjoyed the Slow Food one earlier this year.